...one ugly quilt! 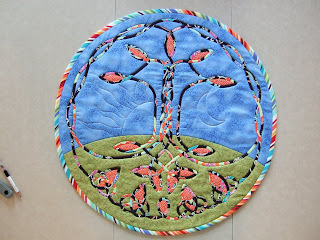 This is the Trend Tex Challenge Lori and i worked on for Quilt Saskatoon 2009. Don't get me wrong, i loved working on this quilt and i love the design but i sure wouldn't have anywhere to hang it in my house. The fabrics are just too bright for me. Now Lori and i had a theory about this challenge...not many people use only the 5 given fabrics, they will added the extra 3 that are allowed. So we figure we have a better chance at winning something if we are in a smaller group of quilts, the Trend Tex award goes to the quilt that only has the 5 fabrics in it, so we have a shot at that. Anyway, the quilt has been mailed and were are now planning our next project together...this time we are seeing PURPLE! You made something ugly look great! You both have the touch!